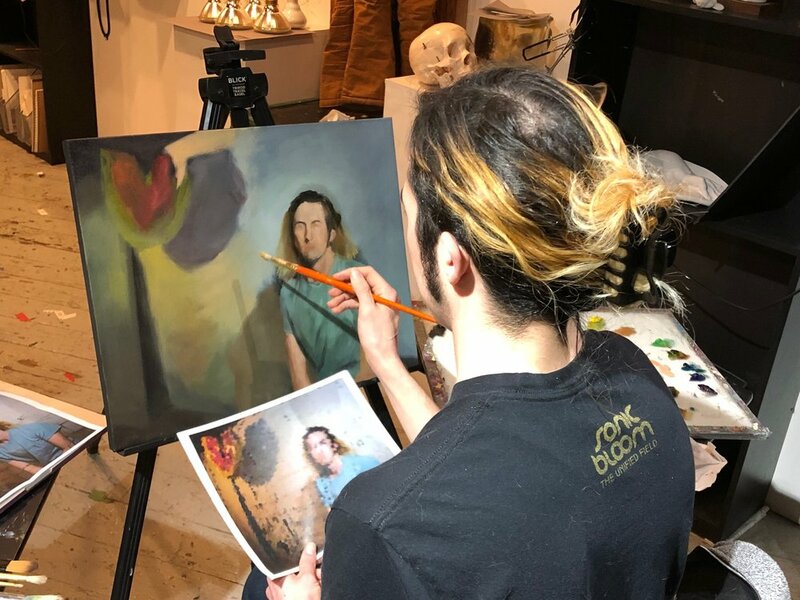 This 6 week class will begin with exercises that prepare you for the final project of completing a portrait in oil from your own photo reference. It’s a perfect opportunity to create a painting of a loved one with professional guidance, or you can choose to work from any reference you prefer such as an existing master painting. In this class, Lacey Lewis will walk you through all aspects of painting realistic oil portraits from photographs. Topics covered will include lighting and photographing the model, identifying an ideal reference for a painting, how to achieve an accurate drawing and likeness, mixing skin tones and applying them correctly, and how to use edges, the background, and other compositional elements to create a strong focal point. This class is perfect for anyone interested in portrait or figure painting, whether a novice or more experienced artist. While it is helpful to have some experience drawing or using oil paint, it is not requisite to participate. All material presented will start with basic techniques and progress through advanced concepts. *Materials provided include oil paint, drawing materials, brushes, palettes, and surfaces for studies. Students should supply their own canvas, panel, or other surface for their final project. Students may also wish to bring their own higher-quality brushes, but this is optional. When we cover photography it will be advantageous to bring your own camera, if you use one. Cell phones can be used if that is all you have available. We will discuss limitations of these devices, and also cover tips for getting the best possible references from them. About the instructor: Instruction is provided by Lacey Lewis, a recognized figurative painter who has been teaching her craft for 10 years. Lewis describes her teaching methods as "Classical Atelier Inspired," combining elements of traditional techniques with more contemporary concepts. She believes that incorporating a variety of philosophies in her teaching gives her students multiple tools to choose from when solving visual problems.